Caydon Property has launched their Flemington development ONLY Flemington. designed the 22 level tower and the internal finishes. Its unique design allows for 360 degree views. ONLY Flemington will include distinctive communal areas and a variety of apartment layouts throughout its 409 dwellings. It was designed with the Flemington Racecourse in mind by providing westerly apartment views over the complex and creating social pods atop the communal Premium Entertainment Deck. The four separate bookable pods are capable of holding between 20-30 people. The Premium Entertainment Deck is a landscaped area with a games room and a karaoke room. The Opulent Sanctuary Deck is on the 19th level and includes a pool, lounge, sundeck, green retreat pockets, gym, entertainment area and dining room. The apartments are designed to be spacious with an emphasis on natural light. It will include one, two and three bedroom apartments. According to EIU and Urbis statistics 41 per cent of Flemington’s population is aged between 20 and 39, while 84 percent are employed in a white collar profession. Both numbers are higher than the Melbourne average. Alongside those numbers 54 per cent of people who move to Flemington live in an apartment and 64 per cent of residents rent. Flemington’s median apartment price is $325 000, well below Melbourne’s average of $505 000. 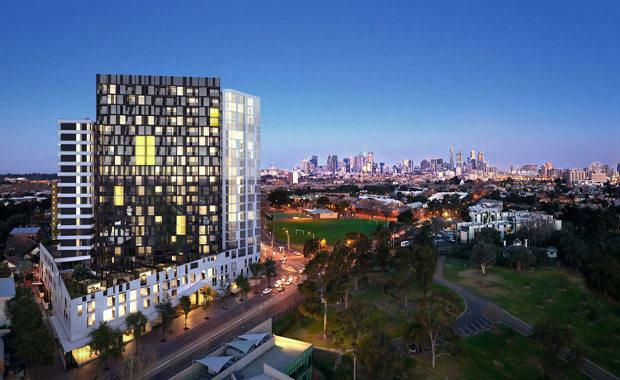 ONLY Flemington’s one bedroom apartments start at $372 000. It is located near the Newmarket Train Station and Melbourne’s central business district. Apartments are on sale now.